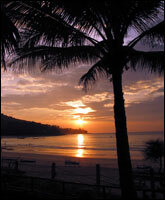 Kamala Beach Hotel & Resort is located in the heart of Kamala beach, on the west side of Phuket island. There is no road going across in between the hotel and the beach. The hotel is easily accessible from the airport, all major beaches and the tourist destinations, just 4 kilometers from Patong beach, and only 35 minutes from Phuket airport. Kamala Beach Hotel & Resort , PHUKET THAILAND offers a choice of 200 tastefully decorated Deluxe rooms. Each room is equipped with air-conditioning, mini-bar, big size fridge, coffee/tea making facilities (only in SV rooms), IDD telephone, satellite TV, movie channel, safety deposit box, private balcony or terrace and separated bathroom with bathtub and hot/cold water. Sea Breeze Cafe' offers authentic Thai & European foods and barbecue dishes including grilled hamburgers, chicken, fishes and a variety of other hot and cold casual foods. Located just a few steps from your spot by the pool or on the beach serving breakfast, lunch and dinner. Our food prices are perfect for our long stay guests and family guests.